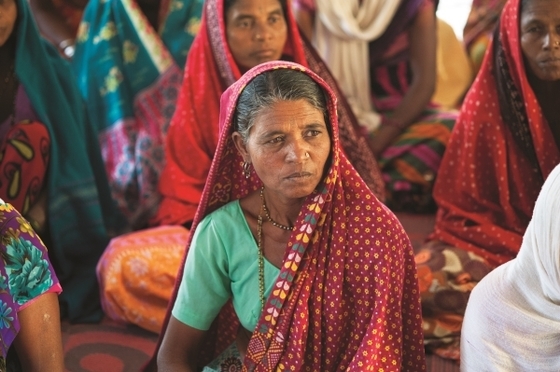 Like the woman pictured, Neeharika started gathering with other believers to learn more about God. Neeharika doubled over, retched, sputtered and watched in horror as blood came out. Over the next several days, the pain and the stress of her illness made it difficult for her to think straight. Her hope wore thin. But then there was a knock at the door, and her pastor, GFA-supported pastor Ganaraj, walked in. Pastor Ganaraj cared deeply for the people the Lord had entrusted in his care. He made it a habit to visit families from his congregation to see how they were doing, to pray for them and to encourage them from the Word of God. “In order to get healed of this sickness,” Ganaraj says, “she had met doctors and took medicine, but she did not find any improvement in her health. She also spent a lot of money. Her family tried their best and made several attempts to bring her healing, but all their efforts failed. After Pastor Ganaraj’s visit, Neeharika decided to attend worship services regularly and spend time with other believers. She also began praying to Jesus more often, trusting in Him for her well-being. Praise the Lord! God continues to move in the hearts and lives of His children, and your prayers for pastors like Ganaraj enable them to minister to people in need, often at just the right moment in their lives. Thank you!